Almost simultaneously, Western retailers and the Bangladeshi government have adopted a series of measures to improve conditions for the country's millions of clothing workers, which activists have been demanding for years. It's a sign of the intense pressure they are under after the collapse of the Rana Plaza factory complex on 24 April - with most of the 1,100 dead lowly-paid garment workers making cut-price clothes for the West. Several big names, including Sweden's H&M, the biggest buyer of Bangladeshi-made clothes, have now signed up to a legally-binding code requiring them not just to meet minimum fire and building safety standards but to pay for them. The UK's Primark and Tesco, and C&A of the Netherlands, have also come on board, before a deadline set for 15 May - although the basis of the code was drawn up more than a year ago. Until the Rana Plaza disaster hit the headlines, only two firms had been prepared to sign: PVH, the parent of Calvin Klein, and Tchibo, a German retailer. Both companies have already said they'll agree to the new terms. Many others are still holding back, though, including some British retailers and the US giant Gap, which is reportedly unhappy at the binding terms of the deal, when it says it is already taking its own measures to boost safety at factories it uses. H&M was under particular pressure to sign from an online petition organised by Avaaz, a human rights group, in the aftermath of the deadly collapse. With the blunt title "Crushed to Make Our Clothes", it has so far gathered nearly one million signatures from around the world. Buoyed by its success, Avaaz says it is now targeting Gap and trying to embarrass others into signing. At the same time, the Bangladeshi government has also announced plans to make it easier for garment workers to form unions. The government has also agreed to talks on raising the minimum wage in the clothing industry from its current level of 3,000 Bangladeshi Taka a month (about £25; $38). It had been stalling on the issue before the disaster, partly encouraged by factory owners - at least of 30 of them also serving MPs in Bangladesh's parliament. Workers' groups say they are pressing for a near tripling in the minimum wage, to around 8,000 Taka per month. Questions remain, though, about this apparent new willingness to reform in the beleaguered industry and the Bangladeshi government. "We had the right to form a union before," says Kalpona Akter, of the Bangladesh Centre for Worker's Solidarity. "But whenever workers tried, factory owners would just harass them and fire them." A central complaint was that factories were able to target anyone joining a union, using their membership lists, which they automatically saw. The government says it will now amend the law so owners no longer have this right - something activists have been demanding for years. They also want to see progress in resolving the case of a garment union official murdered last year - amid widespread accusations of government complicity. Aminul Islam was active in fighting for garment workers' rights but his body was found dumped outside Dhaka in April 2012 bearing clear signs of torture. But so far no one has been arrested - despite the name of one suspect being widely known. While the owner of the Rana Plaza is now awaiting trial, campaigners ask why there has been no move to even question the owner of the Tazreen factory, where more than 100 workers died in a devastating fire last November. They were making clothes for the US giant Walmart, and C&A. Walmart is among those who have not signed up to the new safety code. The company had not responded to an emailed request for comment by the time of publication. 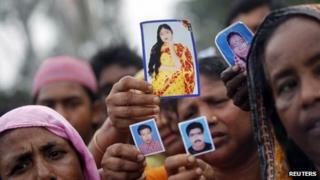 But with major names now signing the safety deal, the many Western clothes companies using Bangladesh are looking more divided. There was already friction within this habitually tight-lipped community, because many firms who were using the Rana Plaza complex have yet to admit their association - in contrast to Primark and Canada's Loblaws, which were quick to come out and promise compensation. Italy's Benetton eventually admitted a link following publication of photographs of its labels in the wreckage and testimony of survivors, though it maintains its subcontractor stopped using the factory a month before the disaster because of poor standards. The key issue for retailers is whether consumers will be prepared to pay higher prices, which seem inevitable now. Government officials worry, though, that retailers may desert Bangladesh, looking for cheaper manufacturers to avoid the toxic publicity the country has now attracted. With its close and many say corrupt ties to the garment industry, critics say the Bangladeshi government made it easy for both factory owners and retailers to resist binding safety measures before the disaster - not doing enough to respond to past calamities like the Tazreen fire. Bangladesh commerce minister Mohammed Quader admitted in a recent interview that the government didn't do enough to "discourage" the worst operators "because we wanted the jobs". A lot has changed now - but only after more than 1,000 people, many of them young women, have been crushed to death. The real test will come once the spotlight has moved on.